Microsoft released the final version of Internet Explorer 8 yesterday. This new version is regarded by many as a step in the right direction as it closes the gap, both speed and compatibility wise, to Firefox, Chrome and other web browsers. There have been talks about webpage compatibility problems in Internet Explorer 8 before which can hurt a web browser's reputation. 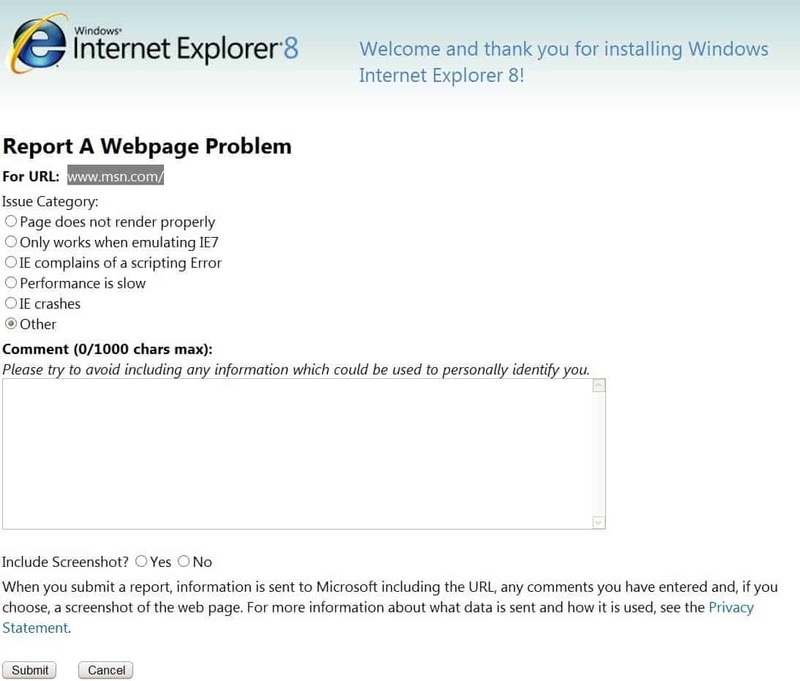 Report a Webpage Problem is an Internet Explorer 8 add-on that can currently be downloaded from Microsoft Download. The add-on is only be provided for a limited time as a download, most likely to sort out and analyze the biggest remaining compatibility issues. The Internet Explorer 8 add-on is a standalone executable for the Windows operating system that gets added to Internet Explorer 8 during installation. The Internet Explorer 8 add-on adds a toolbar button to the command line of Internet Explorer 8 and adds the same link to the web browser's Tools menu as well. Users who want to report a webpage problem while using Internet Explorer 8 simply have to click on the link which then loads a page on the official Microsoft website. This page is a form that allows you to report the compatibility issue to Microsoft. A click generates a screenshot of the current page automatically, and stores it in the temporary Internet files as ReportSiteIssueImage.bmp. Along with the information described above, information about your computer ("standard computer information") is sent Microsoft. Microsoft uses standard computer information to provide you Internet-enabled services, to help improve our products and services, and for statistical analysis. Standard computer information typically includes information such as your IP address, operating system version, browser version, and regional and language settings. This Internet Explorer 8 add-on will definitely be helpful for users who are stuck with Internet Explorer and experience webpage problems. While there is no guarantee that Microsoft will fix all the issues that are reported, it is likely that major issues experienced by many users will be addressed in future updates of the browser. Microsoft released a new Internet Explorer 8 add-on that allows users of the browser to report web page problems and compatibility issues. Fery nice find Martin but why is Ghacks, up to now/so far, the only www website,which i use, which wil not work with the Microsoft internet explorer 8? It is working fine on my system with Internet Explorer 8. I’ve installed IE8 yesterday and i was quite pleasantly surprised. IE7 doesn’t compare to this one. And i believe some Firefox users will give this one a go due to it’s features and all. Having trouble with certain websites going from one page to another.